These are cone flowers from my garden this past summer. Look closely and you'll see the bumble bee on the foremost flower. I used a watercolor process that I call "found leaves" to get more depth in the background. It's fun. After the background is painted with the initial wash and it dries, you look for variations in the color that suggest leaves and paint a darker color around them. Simple and very effective! I have looked at many Painting a day blogs. Nice watercolors! I like the bee. I have been painting 1 still life a day aboard my star ship the Bombay. Thanks, glad you like the paintings. 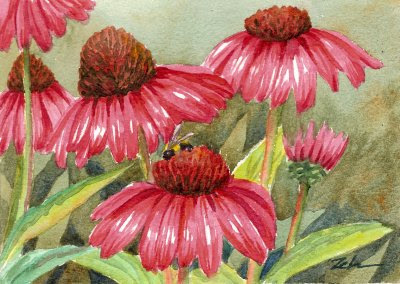 Sometimes the bee just happens to serendipitously fly onto the flowers when I'm painting or photographing.